Need support with a product or purchase? Login to your Healthful Pursuit Customer account here. Once logged in, you can access our team in the “Support” section of your account. We take customer satisfaction very seriously. If this is regarding your recent purchase, we will get back to you in less than 3 business days. You’ll also hear from me with more tips and strategies and can unsubscribe anytime if you don't want them anymore! Head on over to my testimonial submission page. Interested in partnering with Healthful Pursuit or interviewing Leanne for your event? Email my Business Manager (this is not a customer-facing email, so if you email here as a customer, we will not be able to respond). I get flooded with emails and can’t possibly reply to each one. If you have a Healthful Pursuit program, digital guide, or meal plan, you can login to your account to receive support from my team. Otherwise, all of the FAQs I’ve prepared for you should help to answer your questions, ensuring I have oodles of time in the day to continue coming out with free content for you! How do I download my Healthful Pursuit product? It’s simple! We made this tutorial to make it easy to download Healthful Pursuit programs to your device. I’ve exceeded my download attempts, what do I do? We set each of our digital products to have a download attempt limit to avoid issues with sharing content (I know, some bad apples ruin it for the rest of us). If you have a Healthful Pursuit product and have been told that your download attempts have maxed out, simply login to your Healthful Pursuit Customer account and contact us! How do I cancel my meal plan subscription? Log into your Healthful Pursuit Customer Account, click on “Subscriptions” on the side navigation. Once on the page, click “View” then the big “Cancel” button. Which of your products is right for me? First of all, thank you so much for deciding to take me along on your journey of healing yourself with nutrition! I’m so excited for you. I offer a number of fantastic products that’ll help guide you on your path. There are in-depth answers to the most common product questions below and you can also watch this great keto product starter video that will give you a general overview of what’s on tap. What’s the difference between your various keto programs? Happy Keto Body (12-week video training program) is a doctor-approved 12-week journey to a customized keto lifestyle for women. Eliminate frustrations, get fat adapted and stay fat fueled for life. Includes videos, coaching calls and an exclusive online community of keto sisters supporting you every step of the way. The Keto Beginning (digital program and/or audiobook) shows you why eating high-fat works and what to expect in the first 30 days of eating this way. You’ll be guided through how to boost ketones and introduced to basic keto concepts. Fat Fueled (digital program and/or audiobook) shows you how to tailor this eating style to make it work for you from a therapeutic perspective. It includes a mindful meal plan, encouraging you to get in touch with your body to create lasting, effortless change. 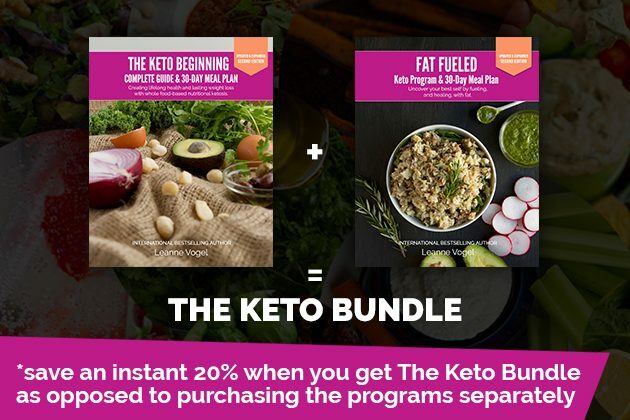 The Keto Bundle (digital program) includes both The Keto Beginning and Fat Fueled programs. If you’re fully committed to living a high-fat, fat-fueled lifestyle, I would humbly suggest picking up both programs so that you can understand exactly why it works, how it can work for you, and how to make it work for you. The combination of incredibly helpful, in-depth guides with meal plans, step-by-step instruction, and personalized support will transform you into a keto warrior. And, of course, It costs less to pick up the books together as the Keto Bundle then it does to purchase each book separately. The Keto Diet (paperback) if you’re already on your keto feet and in the market for lots of great recipes coupled with food instruction and meal preparation how-to, then the paperback will be great for you! The Keto Diet was created to show you how to make your keto life practical with oodles of food preparation tactics, grocery store lists, and keto travel tips. Are all of your programs digital or do you have a paperback option? My book, The Keto Diet, is a paperback. If you’re looking for lots of recipes coupled with detailed food instruction and meal preparation how-to, you’re going to love the paperback. My latest book, The Keto Diet Cookbook is also available as a paperback and will be released April 9, 2019. If you’re in need of recipe inspiration, serious meal planning guidance, and grocery shopping tips, this cookbook will be perfect for you. Pre-order The Keto Diet Cookbook here. Is your paperback book The Keto Diet available as an e-book, too? Yes, the paperback is available on Kindle, iBooks, Nook, and Kobo. The Keto Diet Cookbook (paperback) will be released April 9, 2019 — Pre-order here! In The Keto Diet Cookbook, the focus is all on the food – how to structure your meal plans, how to plan meals based on your goals, what foods to choose, which foods will get you closer to your goal, how to shop for those foods… and the most exciting feature of the whole book – The Keto Diet Meal Planning System. The Keto Diet Meal Planning System provides readers with 3 templates to follow based on their meal planning needs. In one of the templates, you’re guided through determining how much food to eat based on your goals, you’re provided a meal planning combination to follow, and then each of the recipes in the book can plug into your unique combination. This is a unique feature that makes each and every one of the recipes in the book useable! Part 1 explains what keto is and why it works in case the concept of low-carb living is completely new to you. I’ll show you why understanding your body is important to your process – when you understand your body, making decisions becomes way easier. I’ll explain what keto does to each and every one of your essential hormones – and why balancing them is the key to success on keto. And, we’ll clear up some myths and misconceptions that are likely standing in your way of reaching keto nirvana. Part 2 introduces the three sequential steps to becoming a fat burning female. I’ll show you how to figure out what to eat, how to eat it, and why certain foods will work for you, while others will stall your progress. We’ll build a meal plan that’s easy to follow, get you into ketosis (and keep you there) without stressing out about every.little.thing. We will develop a fasting protocol that helps you hit your goals, keeps you satiated, and not going crazy about food. We’ll bust through weight plateaus, figure out why you can’t lose weight, tackle roadblocks in your way, and develop a protocol that makes eating keto for life, so easy. Part 3 will help you go the extra mile to improve specific health conditions from PCOS, autoimmunity, inflammation, horrible experiences with menopause, cardiovascular conditions, gut support, and more. We’ll work together to customize your keto with tiny little tweaks that’ll make a world of difference. Keto for Women will give you everything you need to fully embrace the Keto Diet, adapt it to your unique needs, and – most importantly – actually enjoy the process of achieving the results you want. Balanced Keto is a meal plan subscription program. You receive weekly meal plans, directly to your inbox, along with wonderful shopping lists and dietary modification guides that’ll cover just about any food sensitivity. (You can download a free sample of the meal plan here!) Keep in mind, these meal plans have carb-ups already built into them, so it’s usually best to get yourself fat-adapted first by following The Keto Beginning or Fat Fueled program. Alternatively, you could simply skip the carb-ups in the meal plans for the time being, replacing them with fat until you’re fat-adapted. Can the Balanced Keto Meal Plans be personalized? The Balanced Keto Meal Plans are not customizable at this time. However, your purchase of a meal plan subscription comes with an extensive dietary modification guide that offers loads of great tips and tricks on how to make your meals egg-free, nut-free, nightshade-free, or low-FODMAP. Is the Balanced Keto Meal Plan subscription recurring? Yes, the Balanced Keto Meal Plan subscription is recurring, so you don’t have to worry about renewing anything. Your subscription will automatically renew at the end of each payment period, depending on your subscription level (e.g., 30 days, 90 days, or 365 days). Do you track macros in your Balanced Keto Meal Plans? No, we do not track macros in the Balanced Keto Meal Plans. This program follows the Fat Fueled approach in which there’s a deliberate intention to eat low-carb, high-fat – and to keep the focus off of counting. We keep the plans in line by sticking to 15 to 25% protein and 30 to 75g of carbs a day. This is influenced by carb-ups. The meals contain approximately 2,000 calories per day, including snacks. If you’re looking for a meal plan that takes macros into account, I’d suggest utilizing the 30-day meal plan found in The Keto Beginning, which includes a breakdown of macros and other nutritional information for each day. How do I cancel my Balanced Keto Meal Plan? We’re sorry to see you go! Tweak your subscription by accessing your Healthful Pursuit Customer account. What’s the difference between your audiobooks and digital programs? My keto audiobooks (available on Amazon) include the audio version of the book and, in lieu of a full transcript, a PDF of the recipes and meal plans only. For a full transcript of the books, you’ll need to get the digital keto programs. Please note that, as of October 1, 2017, the original Fat Fueled, Keto Beginning and The Keto Bundle programs were updated and expanded. The audiobooks were not. The audiobook files and complimentary PDF audiobook resource guide are based off of the first version of the book. Does the Keto Audiobook Bundle come with full-text transcripts for each book? The audiobooks do not come with full-text transcripts. They do, however, come with a PDF audiobook resource guide of all the recipes and meal plans included in the books. 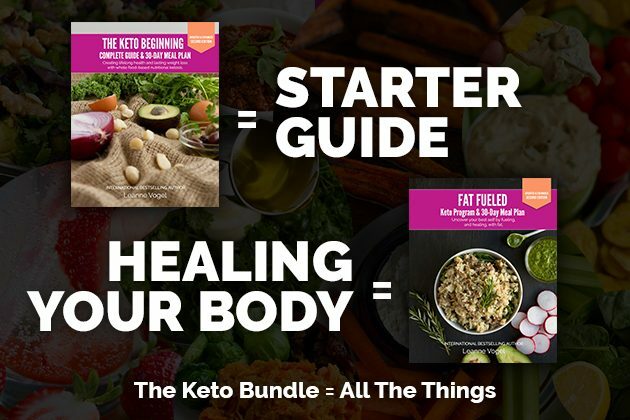 If you’d like the full-text version, pick up The Keto Bundle. The 21-Day Whole Keto Challenge (21-day email-based program) is a daily coaching program to compliment your healthy keto lifestyle. Repair your relationship with your body and start living your joy now. The program includes a digital 21-Day Whole Keto Challenge Workbook, 21 inspirational emails, body acceptance missions, as well as affirmation wallpapers for your phone. Please note, The 21-Day Whole Keto Challenge is NOT a keto diet eating plan. If you’re looking for a keto ‘how-to’ program or meal plans – I’ve got plenty to share with you. Instead, this will complement your keto diet. But you don’t have to be keto to benefit from The 21-Day Whole Keto Challenge. What’s your refund policy for your digital products? Due to the digital nature of our products, we cannot give refunds or offer exchanges after a product has been downloaded and refunds cannot be processed beyond 30 days of the initial purchase date. But don’t worry, you’re going to be happy with your purchase! I’m having trouble downloading my digital product. What should I do? Sorry about that! Simply get in touch with us via our contact form. Let us know what type of device you’re using and if you’re receiving any error messages, and we’ll get it straightened out. Do you ever give discounts or run promotions for your products? As a matter of fact, I do! The best way to stay up-to-date on discounts is by subscribing to the Healthful Pursuit newsletter. Why are your products dairy-free? Feel free to check out my full breakdown as to why I don’t eat dairy. But, suffice to say, I’ve chosen to go the dairy-free route with my products for a few key reasons: 1) Many people simply can’t tolerate lactose, 2) It can make becoming fat-adapted more difficult, and 3) It can lead to inflammation and other autoimmune issues. Why are your prices in USD? 80% of Healthful Pursuit customers are located in the USA, so we just found it easiest to operate in USD. Why do you promote your products when answering questions? When it comes to mentioning Healthful Pursuit products, I do this because it’s the only way the business generates revenue, but more importantly, the products have helped thousands of people reach their goals. Without sales of our digital programs, like The Keto Bundle, we wouldn’t be able to have a website and in turn create free resources. All of the money generated from these digital sales helps employ a team that works with me to maintain the website, come up with new content, edit videos, prepare audio files, create the free mini guides for all videos, prepare transcripts, answer blog comments, schedule videos, create design graphics, update old content, support people via email, interact with people on social media, answer questions in various places, create new products and services to help more people, etc. Without revenue coming in none of this would be possible. Well, if what you’re currently doing isn’t working, why not give it a go? It’s certainly worked for me and many others. Now, I’m not your healthcare provider, so I can’t speak from a medical standpoint. But I’ve put together a helpful resource that’ll assist you in deciding whether or not keto is right for you. Additionally, you can avail yourself of this lovely video where I address a few of the most common keto questions newbies have tossed around over the years. How do I get started eating keto? Here’s a video that should help you get started on your keto path. Additionally, both Fat Fueled and The Keto Beginning are excellent resources to get you off the ground. You’re in luck. I’ve compiled in-depth breakdowns of exactly what I eat for breakfast, lunch, dinner, and snacks (with helpful pictures included). I also have examples of what I eat on carb-up days and what I eat on Intermittent Fasting days. What’s the difference between a low-carb diet and keto diet? Low-carb diets are just, well, low-carb. A simple low-carb diet makes no distinction as to how much protein or fat you should take in to supplement your lack of carbs. On the other hand, a ketogenic diet is not only low-carb, but high-fat. While there’s no set rule, it’s generally suggested to keep your carb intake between 5-10%, your protein intake between 15-30%, and your fat intake between 60-75%. Keto is a fantastic option for plant-based living! The information and guidance offered in my keto books and programs can work for just about anyone. The meal plans and recipes provided do contain meat, but they’re simply templates. You have my blessing to add or subtract whatever is necessary to make them your own. Check out my video about thriving as a vegan or vegetarian on keto. Rest assured, all of my programs are 100% gluten-free and dairy-free. Chapter 6 of my in-depth Fat Fueled guidebook is chock full of information on allergies, restrictions, and preferences, and contains solid suggestions for thriving on keto while staying away from various foods (e.g., nuts, eggs, FODMAPs, nightshades, avocados, meat, and more!). If you’re interested in the Balanced Keto Meal Plan subscription, have no fear – it comes with a food sensitivity guide offering up fine ideas for making your meal plan nut-free, egg-free, low-FODMAP, and nightshade-free. I have two awesome resources for pregnant and breastfeeding mothers: a video I made on pregnancy and keto, and a podcast episode covering pregnancy and keto. Treat yourself to an entire podcast episode dedicated to thriving on keto through and after menopause. I’m so glad you asked! Here’s a podcast episode covering PCOS and keto! You betcha – I can personally attest to it! Learn how eating keto helped me overcome my 8-year (yes, 8 long years) battle with amenorrhea. You can also listen to an awesome podcast episode that breaks down battling amenorrhea. Chapter 14 of my in-depth Fat Fueled guidebook is all about fertility and hormones, where I offer plenty of tips for correcting hormone imbalances. Additionally, here is a podcast episode on balancing hormones. Chapter 15 of my in-depth Fat Fueled guidebook includes a section devoted to thyroid imbalances and includes some great tips for supporting the thyroid. On top of that, you can avail yourself of all of my of free thyroid health resources. Chapter 15 of my in-depth Fat Fueled guidebook includes an entire section on adrenal dysfunction as well as tips for supporting your adrenals. But wait, there’s more! Get a load of this excellent video on keto adrenal fatigue. I have diabetes (Type 1 & 2)? In short, welcome aboard! Please watch this video where I offer my thoughts about and experience with my diabetic clients who’ve practiced keto. Great question! I have a video that will tell you all about keto and cholesterol. And a good follow-up resource would be my podcast episode on the all-too-common fat fear. This question calls for my video breaking down the 10 reasons why I’m not afraid of fat and you shouldn’t be either. I don’t have a gallbladder? No shirt, no shoes, no gallbladder? No problem! Check out this great little video where I address keto without a gallbladder and fat digestion issues. Check out this fabulous podcast episode on strength, performance, and training hard on keto, this podcast episode on how to be a keto athlete, and this video on exercise and keto for women. I’ve seen loads of men experience success with this eating style. Check out this video explaining how men can thrive on my keto programs. How will I know if I’m fat-adapted? You can always test for ketones, or you can watch this video for the list of signs you’re fat-adapted. Is being in ketosis the same as being fat-adapted? Not quite! You can find a marvelous explanation in this video on the difference between the ketosis and fat-adapted states. What are the best keto fats? Should I eat dairy on keto? I personally don’t eat dairy on keto for a few reasons. However, if it feels good in your body and you do well with dairy, feel free. I truly believe you can live this life without counting your carbs, obsessing over macros, or having something like MyFitnessPal rule your life. I sure am and I know you can do it, too! Watch this video on why I don’t count my macros on a ketogenic diet. This video was inspired by the content of my program, Fat Fueled, which also helps you learn how to eat keto without needing to count macros. Should I intermittent fast? If so, how? If you’re naturally capable of going anywhere from 12 to 24 hours without food, without effort, congratulations! You’re ready to jump into intermittent fasting. If, on the other hand, you’re pushing and prodding your body to go sans food for 12 hours and you’re waking up super hungry, grumpy, feeling restricted, and binging on Oreo cookies at hour 11 – then perhaps stop and re-evaluate. Whenever I’m feeling up to the task, my favorite way to intermittent fast is with a delicious Rocket Fuel Latte. It ensures that my hormones feel supported and it tastes amazing. You can also check out a podcast episode I did on carb-ups & fasting and a podcast episode covering fasting vs. calorie counting. Can I still exercise on keto? You sure can! I’ve even compiled a list of my favorite ways to exercise on keto. Also, I have a podcast episode on optimizing exercise while eating keto that includes keto exercise strategies, pre- and post-workout fuel, and tips on increasing muscle and performance. What are your thoughts on exogenous ketones? Until recently, I haven’t been too keen on exogenous ketone use because I see it being abused so often. Where people will use the supplement as an excuse to be hard on their bodies, using exogenous ketones as an escape route for “eating too many carbs”. BUT if used responsibly, I feel like they can have a place in your ketogenic journey. What are your thoughts on hormonal birth control? Do I have to get off birth control to balance my hormones? I didn’t have a great experience using hormonal birth control and I’ve seen many women who were in the same camp. However, you may find that hormonal birth control works really well for you! So, it’s totally your decision. If you choose to stick with hormonal birth control, I have a podcast episode that addresses how to balance your hormones while on birth control. Also, here’s an informative blog post that outlines the potential health risks of taking hormonal birth control. What are your thoughts on hormone replacement therapy (HRT)? You’ve come to the right place! I’ve written a 3-post series outlining my journey of balancing my hormones and healing from amenorrhea, including my experience with and thoughts on HRT: 1) The One Thing Holding Me Back, 2) The Last Chapter, and 3) It’s Just Not Okay. Additionally, this blog post also outlines the steps I took with HRT. And, finally, I have a great podcast episode where I interview Dr. Reiss Uzzi, a specialist in hormone balancing, about HRT. What supplements should I be taking? What should I avoid? Since everyone is so different in terms of their health, nutrition, and genetics, it’s best to speak with your doctor and/or healthcare provider about the supplements you should or should not be taking. But if you’re curious, here’s a video where I chat about the supplements I take and why. I need to work with someone one-on-one. Do you do keto coaching? I’ve transitioned out of one-on-one sessions. However, I have a 12-week keto program that includes coaching. It’s called Happy Keto Body. What kind of healthcare provider should I be looking for? I’ve found that functional medicine, naturopathic, orthomolecular, and osteopathic doctors are the best way to go. Before making an appointment, don’t be afraid to advocate for yourself and ask the questions that are important to you. A few questions you may want to consider are: Is this provider supportive of a ketogenic eating style? Does this provider specialize in the issue I’m experiencing or the condition I have? Does this provider subscribe to the Health at Every Size viewpoint? Can my kids eat keto along with me? Such an important question! Kids will usually need to eat more carbs their adult counterparts, so their plate may look a bit different than yours. In general, I’ve seen many parents who have found it beneficial to increase the overall healthy fats that their kids consume. Here’s a podcast episode where I chat with Lori Kennedy about how to be a keto mom and provide your kids with healthy high-fat options. What are your favorite keto products? What makes up your shopping list? Girl, have you come to right place. I’ve amassed a ton of favorite keto products over the years and compiled a super awesome top keto products list. What are your favorite keto books and cookbooks? Feel free to check out all the keto books and cookbooks that have helped me on my journey. Happy reading! Since everyone’s physiology is so unique, we cannot guarantee that weight loss will occur by following our plans. If you’ve been doing your darnedest and weight loss just isn’t happening, check out one of the helpful sections below on weight loss stalls. Why am I not losing weight on keto? Or, why am I gaining weight? Great question. Let’s figure it out! I’ve put together a helpful keto resource covering weight loss stalls and weight gain. What is keto flu? Will I experience it when I start eating keto? If you’re currently like a lot of us were when we first started out – eating high-carb and low-fat – it’s possible that when you switch over to eating keto, you may experience the dreaded “keto flu.” When you begin to eat Fat Fueled, your body is thrown off slightly. The flu-like symptoms you may experience are due to carbohydrate withdrawal and its effects: hormonal changes and electrolyte imbalances as your body works to define its new normal. Symptoms of keto flu can include foggy brain, nausea, diarrhea, cramping, fatigue, high blood pressure, shakiness, muscle aches and pains, and/or arrhythmia. To help prevent keto flu, be sure to drink lots of water and boost your electrolytes with a clean electrolyte powder like Ultima. Is it normal for your cycle to change on keto? When you first start eating keto, you may find that your cycle goes a bit wonky and you experience spotting, skipping a period, a longer period, etc. This often happens when we have an underlying hormonal imbalance and eating higher fat is actually helping to stabilize it. The good news is that, over time, eating keto should help your cycle find it’s own balance, especially when paired with the hormone balancing strategies laid out in Fat Fueled. And, of course, I’d recommend working alongside a healthcare provider for optimal results. Is it normal to lose your period on keto? While rare, losing your period on keto can happen for a few simple reasons: 1) you’re not eating enough, 2) you’re not eating enough carbs, or 3) you’re really stressed. I’ve found that eating more overall and/or creating a genuine self-care routine can be very beneficial. You can learn more about balancing hormones by checking out my Fat Fueled program. Is it normal to feel extra hungry on keto? You’re not alone. Personally, I felt like I had an absolutely insatiable appetite when I first started eating keto and I find that many other people have had a similar experience. This happens because your body is trying to switch its fuel source from glucose to ketones, and there can be a bit of a physical “learning curve” during the transition. Just keep chowing down on the plan and honoring your hunger. Your body will get the hang of it eventually and your appetite will balance out. If you continue to have this issue even after you’ve become fat-adapted, I’d recommend playing around with your macronutrient intake with a carb-up, for example. Is it normal to experience digestive issues like diarrhea, gas, bloating, and nausea? If you have any of these side effects from keto, it may mean that your body has a hard time digesting fats. I have an excellent video with tips on how to improve digestion while on keto. Is it normal to start losing hair on keto? Like any significant dietary change, a strict ketogenic diet can unfortunately result in some hair loss. However, this usually occurs when you’re not eating enough carbs. Increasing your overall carb intake or incorporating a few carb-ups each week can help!